Known for its Space Western theme, Trigun is about a man named "Vash the Stampede" and the two Bernardelli Insurance Society employees who follow him around in order to minimize the damages inevitably caused by his appearance. Most of the damage attributed to Vash is actually caused by bounty hunters in pursuit of the "60,000,000,000$$" (sixty billion "double dollars") bounty on Vash's head for the destruction of the city of July. However, he cannot remember the incident clearly due to his amnesia. Throughout his travels, Vash tries to save lives using non-lethal force. He is occasionally joined by a priest, Nicholas D. Wolfwood, who, like Vash, is a superb gunfighter with a mysterious past. 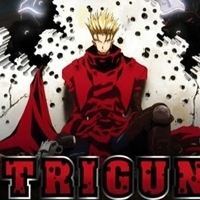 7605 users rated Trigun [TV].